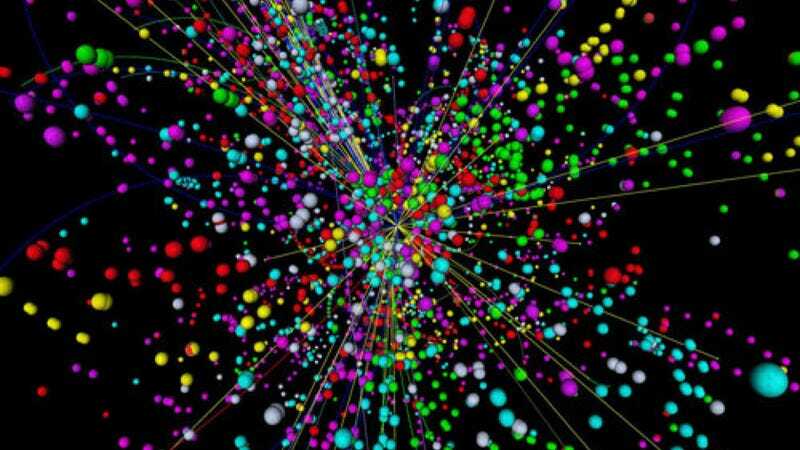 Muons, neutrinos, supersymmetric partners, the infamous Higgs boson - with so many different subatomic particles flying about, it's no wonder theoretical physics can be so confusing. That's why we made this (reasonably) simple guide to all the different elementary particles. This is, as you might imagine, a pretty big topic, so we're splitting it into (at least) two posts. Today we're going to deal with just the particles that physicists are certain (or, at least, reasonably certain) exist, and then tomorrow we'll get into the even stranger world of particles that have been hypothesized but may or may not actually exist. I've also made a handy cheat sheet listing all the elementary particles and their vital statistics, which you can find here. But to understand what all of that means, you'll really want to read on. Part of what makes this task difficult is that there's so many different ways to organize the subatomic particles, depending on which particular property you're interested in. So let's go back to middle school physics and start with the three subatomic particles most people have heard of: electrons, protons, and neutrons, the three components of any atom. That means those three are the basic building blocks of pretty much all matter - at least, matter of the non-dark variety. Physics has been searching for the smallest possible form of matter since the time of the ancient Greeks - the word "atom" has its origins in the Greek word for "indivisible." Of course, the work of early twentieth century physicists like J.J. Thomson and Ernest Rutherford proved the atom actually was divisible, but it wasn't until the late 1960s that scientists discovered protons and neutrons themselves were composite particles, the result of combining still smaller particles known as quarks. Now, one of the most basic properties of electrons, protons, and neutrons is their charge. Electrons are negative, protons are positive, and neutrons are, unsurprisingly, neutral. It's the attractive electromagnetic force between protons and electrons that holds atoms together, and it's the different charges of various ions that causes atoms to combine into molecules. But let's keep this subatomic. The thing to keep in mind is that all particles must have an electromagnetic charge of -1, 0, or 1 - the charges of electrons, neutrons, and protons respectively. (Actually, certain particles can have a charge of 2 or -2, but the really crucial bit is that all charges must be integers, and -1, 0, and 1 are by far the most common.) Anyway, that's all simple enough, right? Good, because I'm about to contradict that completely. This will be a recurrent theme. Like I said, protons and neutrons are made up of different combinations of quarks. Quarks are one of the three major groups of known elementary particles. There are six types, or flavors, of quarks, half of which are up-type quarks with positive charge and the other half are down-type quarks with negative charge. Here's the list of the flavors and their charges: up, charm, and top quarks are +2/3, while down, strange, and bottom quarks are -1/3. Hadrons make up the vast majority of composite particles, and both protons and neutrons are hadrons. Specifically, a proton is made up of two up quarks and one down quark, which gives it its +1 charge (since 2/3 + 2/3 - 1/3 = 1). Neutrons have the opposite structure, which is one up quark and two down quarks, which makes for a neutral charge (2/3 - 1/3 - 1/3 = 0). 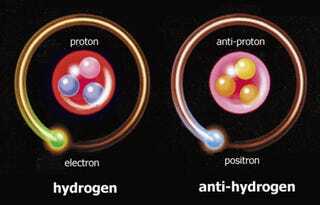 You can see the proton above and the neutron below. Any hadron that is made up of three quarks is known as a baryon. We'll get back to the other type of hadron in a little bit, but first let's return to electrons. Electrons are the best known members of another major group of elementary particles, the leptons. Just like quarks, there are six flavors of leptons. These flavors can be divided into three generations, with each successive generation much more massive than the one before it. The same is true of quarks - up and down quarks are the lightest, then charm and strange, then top and bottom. Only the lightest leptons and quarks are stable, which is why up and down quarks form protons and neutrons, and it's why electrons are found in atoms and not their heavier counterparts. The electron and the electron neutrino are the first generation of leptons, and the other four leptons are the muon, muon neutrino, tau, and tau neutrino. The electron, muon, and tau all have the charge -1, while the three neutrinos have a neutral charge. So that's the quarks and the leptons, which together form a group known as the fermions. Exactly what makes a fermion a fermion is a bit complicated, but suffice it to say that fermions are all the particles that deal with matter. So what about the last group of elementary particles, the ones that don't deal with matter? These are the bosons, and they deal with the fundamental forces of the universe. We've already mentioned a couple of them - there's the electromagnetic force, the strong nuclear force, and the weak nuclear force, which is mostly responsible for the beta decay process we were just discussing. All of these forces create fields that the matter particles pass through, and the bosons are responsible for carrying these fundamental forces between the matter particles. Without the bosons to act as mediators, the other particles wouldn't be able to experience the effects of the various forces, which would mean quarks couldn't combine into protons and neutrons without the strong force, and neither of these could combine with electrons to make atoms without the electromagnetic force. There are four known elementary bosons: photons, which mediate the electromagnetic force, gluons, which deal with the strong force, and W and Z bosons, which are responsible for the weak force. All of these have neutral charge, except for the W bosons, which have -1 charge. Both gluons and photons have zero mass, which means, according to general relativity, both of them must travel at the speed of light. That seems a bit obvious, I guess, considering photons are light particles. We've nearly reached the end of of the known particles, but there are two more groups we need to deal with: mesons and antiparticles. Mesons are the other type of hadron, which feature only two quarks instead of the three seen in baryons like protons and neutrons. Now, if you'll take a look at the quark charges, you'll notice all the up-type quarks have +2/3 charge, and all the down-type quarks have -1/3 charge. That means there's no way to combine only two quarks to get a composite particle with an integer charge. The way out of this mess is that it isn't actually two quarks that combine to form a meson - it's a quark and an antiquark. Antiquarks are one group of antiparticle, along with the antileptons and antibosons, and all of these antiparticles have the opposite charge of their particle counterpart. For instance, one of the most common mesons, the pion, is made of an up quark and a down antiquark, which gives it a positive charge (2/3 + 1/3 = 1). Other than that reversed charge, antiparticles are pretty much identical to their particle counterparts. I say "pretty much" because there are still a few reversed features. These rather subtle properties include the baryon number, the lepton number, and color. Those first two properties are fairly easily calculated by subtracting the number of antiquarks from the number of quarks and the number of antileptons from the number of leptons, but what about color? Basically, color is the strong force equivalent of electromagnetic charge, and it's known as color because it has three basic aspects (compared to the two aspects of charge - positive and negative), which have been called "blue", "red", and "green" after the primary colors. But besides these more subtle features and the charge, antiparticles really are practically indistinguishable from particles. They have the same mass, the same spin, the same lifetime...indeed, an entire antimatter Earth could theoretically exist, and it would be exactly the same as our Earth except all the charges would be flipped (and a few other minor things, but charge would be the only obvious difference). Of course, there isn't an antimatter Earth because, for reasons we're only now starting to understand, matter managed to dominate antimatter in the universe's earliest moments, and so any antimatter that now comes into existence is quickly annihilated when it runs into its matter counterpart. Here's the tricky part (well, the even trickier part, at any rate). Antiquarks aren't just antiparticles - they're elementary antiparticles, and the same goes for other antiparticles like the antineutrino or the antielectron, which is better known as the positron. But there are also composite antiparticles, like the antiproton or the antineutron, and the relationship between elementary and composite antiparticles isn't always straightforward. To see what I mean, let's take another look at the pion. It's a meson, which means it's a composite particle. But it's made of a quark and an antiquark, meaning it's equal parts elementary particle and elementary antiparticle. And that's just one kind of pion - the negatively charged antipion is made of a down quark and an up antiquark (-1/3 - 2/3 = -1). Again, one elementary particle and one elementary antiparticle, but this time the result is a composite antiparticle. This also explains how something like an antineutron can exist. I've said antiparticles have the opposite charge of their particle counterparts, but neutron has no charge. So what's the difference between a neutron and an antineutron? It's all to do with the elementary parts. Like I discussed earlier, a neutron has one up quark and two down quarks (2/3 - 1/3 - 1/3 = 0), but an antineutron has one up antiquark and two down antiquarks (-2/3 + 1/3 + 1/3 = 0). Though the net charge is the same, the components are reversed, and that's why neutrons and antineutrons can annihilate each other just as well as electrons and positrons or protons and antiprotons can when matter and antimatter meet. But that only explains the existence of composite neutral antiparticles - what about elementary neutral particles, like the neutrino? We've already mentioned the antineutrino, so it must have something that distinguishes it from the neutrino. Well, the short answer is that...it doesn't, at least not as far as physicists can tell. The antineutrino and neutrino are seemingly identical, which means they might be Majorana particles, which is any particle that is its own antiparticle. All the neutrally charged bosons are definitely Majorana particles, but the neutrino would be the only fermion to earn that title. However, the current consensus is that, though it's not impossible, neutrinos probably aren't Majorana particles, in part because of those quantum properties I mentioned earlier. It looks as though the lepton numbers of neutrinos and antineutrinos are different: +1 for neutrinos and -1 for antineutrinos. There are also composite Majorana particles, such as the third type of pion, which is made of either an up quark and antiquark or down quark and antiquark. Since this particular meson is combining a particle with its own antiparticle, it's not exactly surprising that it's its own antiparticle. And that just about does it for all the particles and antiparticles we know about. Like I said at the beginning, I've made a cheat sheet for all the known elementary particles - feel free to refer to it whenever you mix up your muons and your gluons. Unfortunately, there are simply too many different combinations of composite particles to make a cheat sheet for them, but I did include the two most important hadrons in the elementary particles cheat sheet. Also, if any of this is still confusing - which is perfectly understandable - feel free to leave questions in the comments or email them to me at alasdair@io9.com. If there are enough questions to warrant it, I'll do a post next week making sense of everything we've discussed this week. Huge thanks to our resident physicist, Dr. Dave Goldberg, for clearing up a few technical points; you can read more of his stuff at A User's Guide to the Universe and in his "Ask a Physicist" series here at io9.